As the national voice for hog producers, the Canadian Pork Council relies on the involvement of pork producers from across Canada to serve on its Board of Directors. These producers establish priorities and make decisions that advance, promote and protect the excellence of Canadian pork production. Over the last several years, the Canadian Pork Council (CPC) has been fortunate to work with many producers who have committed their time, generously offered their expertise and contributed their on-farm experience during their term on the CPC Board of Directors. Their active participation allowed the CPC to address a wide range of issues on behalf of all Canadian pork producers. As part of its national mandate, the Canadian Pork Council is updating its Food Safety and Animal Care on-farm programs which are key components of the Canadian Pork Excellence platform. This extensive work would not have been possible without the leadership and support of two outgoing board members; Teresa Van Raay, a producer from Ontario, and Dickson Gould, a producer from Saskatchewan. Ms. Van Raay chaired the management committee and the food-safety committee, and Mr. Gould chaired the animal care committee. Together, they ensured the updates to the program reflect the great work being done by producers. With over 70% of Canadian pork production exported to more than 100 countries, trade is of utmost importance to the industry. The CPC has been able to count on Directors Normand Martineau, from Québec, and Bill Wymenga, from Ontario, who regularly represented Canadian pork producers in building relationships with international partners. Their leadership and ability to forge partnerships are highly valued and contributed to an enhanced level of understanding with representatives from other countries. Animal health and expanding research to improve the production of pork in Canada are also at the forefront of the CPC’s priorities. Mr. Martineau played a significant role in the research aspect by working closely with Swine Innovation Porc on many issues. The CPC was also able to count on David Duval, a producer from Québec who, after stepping down from the CPC Board of Director continued his leadership role as Chair of Les éleveurs de porcs du Québec. His keen interest in animal health enabled the CPC to address numerous issues at national levels, along with groups such as the National Farmed Animal Health and Welfare Council. Along with Mr. Wymenga, Mr. Martineau and Mr. Gould, Frank Novak, a producer from Alberta, brought key expertise in business risk management to the Board. Together, they shared their expertise with colleagues and other industry stakeholders. This first-hand knowledge of the business aspect of pork production was greatly appreciated and allowed the CPC to advocate effectively on behalf of Canadian pork producers. Without the dedication of these hard-working producers, the pork industry would not be where it is today. 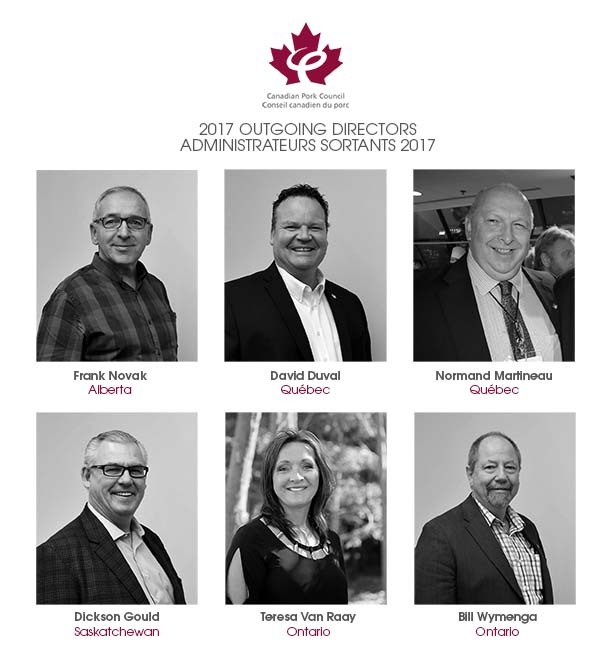 The Canadian Pork Council is deeply grateful for the lasting contributions of its 2017 outgoing directors.